Roasting in coconut oil adds a deliciously subtle hint of coconut and this works so well with broccoli. 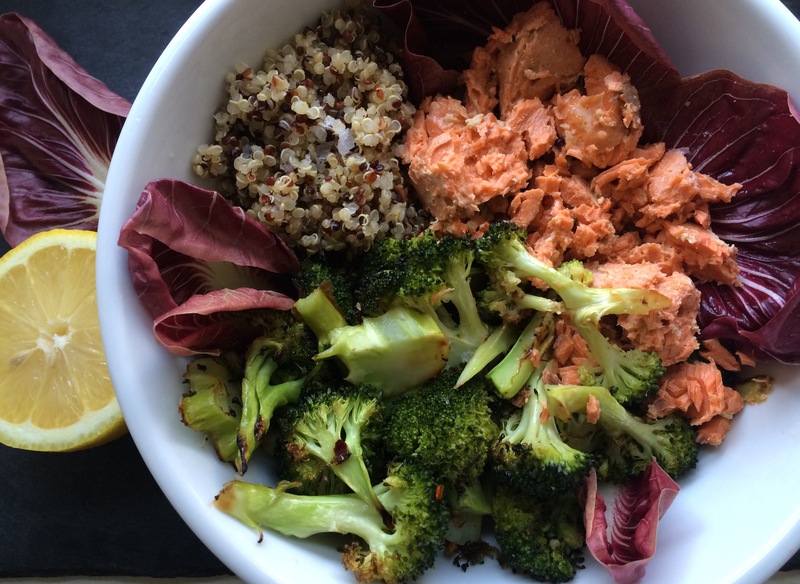 I’ve added some to this lunch bowl along with salmon, quinoa, and treviso leaves (a type of radicchio). This is simply dressed with lemon juice and Maldon sea salt flakes and black pepper. Mix coconut oil and broccoli florets on a baking sheet so they are evenly coated and season with salt and pepper. Roast in a preheated 425F oven for 10 or so minutes (until starting to brown and broccoli is cooked thru). Add to your bowl along with the quinoa, salmon, treviso and season with lemon juice and salt and pepper. *Note: if your coconut oil is still solid you can place jar in a bowl of hot water and it will melt right away. this picture is so pretty! The colors of this meal make it really appealing. Thanks for sharing!